And, it doesn't cost you one penny. ALL of the methods discussed within are ones I've used to earn tens of thousands of dollars online since 2007 -- you can too! From January 1, 2010 to September 23, 2010, I earned $84,358.24 in affiliate marketing (see graphic on Page 6). And, I did it all using free techniques – the very ones I’m going to share with you here. Latest Update of this Ebook: December, 2012. I decided to write this e-guide because I got into affiliate marketing – for good – in late 2008. I’d dibbled and dabbled before, but never made any real money at it and quite frankly, I’m not surprised. I was like a lot of new affiliate marketers – frustrated at not making money online; especially when I kept reading story after story after story of some guy who started last month and was making $10,000 per month. So, this information if for anyone who doubts that you can make money online in affiliate marketing. I’m here to tell you that you can! And, I’m still a novice, but I earn a consistent four figures per month doing it. In fact, I’ve made my living completely online since 2007 and part of it is due to my affiliate earnings. 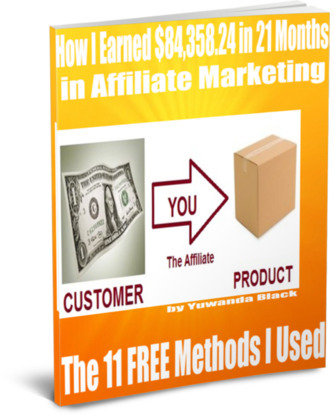 The second group this ebook is for is those who already believe you can make money in affiliate marketing, but haven’t quite discovered a winning formula yet. Maybe by seeing some of the tactics I employ – and my rationale behind them – you can put together a successful marketing strategy that will make your affiliate earnings grow and become consistent. It took me a while, but mine now are. Now, I’m trying to get to the next level, eg, break five figures per month. Learn Affiliate Marketing the Easy Way! Here I discuss all of the FREE methods I still use to this day – when I could well afford to spend money on things like PPC (pay per click) ads. While I may go this route one day, right now, I’m comfortable. My affiliate marketing income is rising and I’m investing time in building my affiliate marketing business’s infrastructure (ie, subscriber list, putting out new products), so have no urgent need to invest time in learning the intricacies of paid methods like PPC (where you can lose your shirt if you don’t know what you’re doing). You see, you have to treat affiliate marketing like a real business (which is what it is) to succeed. Once I started doing this, I started making good money -- consistently. The most I’ve ever earned in one day is $900. And while that’s nowhere near what the big-shot affiliate marketers earn (many earn tens of thousands of dollars per day), I consistently earn $100-$150/day, which is enough to allow many to quit their full-time jobs. Wow! I can really make a living doing this! Once I saw how successful I was promoting my sister’s ebook on backpage, I started placing ads for my own ebooks and e-classes. I started to sell more. Then I started promoting other products and services on backpage, via article marketing, on my blog/website, etc. I have to admit, I went kinda crazy trying out new products to promote. In short, I was “affiliate program hopping” – and started to dilute my sales. After a while, I settled into affiliate marketing seriously, honing in on a few products – ones I use consistently – that I promote regularly, along with my ebooks, of course. And as I’ve said, I’ve been able to earn a consistent $100-$150/day doing so. Following are the FREE promotional methods I’ve used – and continue to use – to successfully sell a myriad of products and services online – my own and those of others.